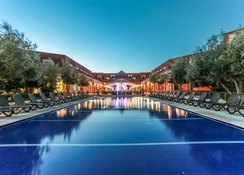 The Eden Andalou Aquapark & Spa is easily one of the prettiest 5-star hotels in Marrakech There are 253 guestrooms and suites furnished and Moroccan accents, the hotel offers an oasis of unparalleled luxury where guests can enjoy a comfortable stay. Surrounded by lush gardens with two lovely swimming pools (heated in the winter), this hotel has plenty to keep guests entertained - further facilities include a spa and fitness centre, the exciting aqua park with slides and flumes, a kids’ club and sports activities – so you’ll find something for everyone. Eden Andalou Aquapark & Spa Resort has a clutch of specialty bars and restaurants to cater to the guests, featuring both International and traditional Moroccan cuisine. 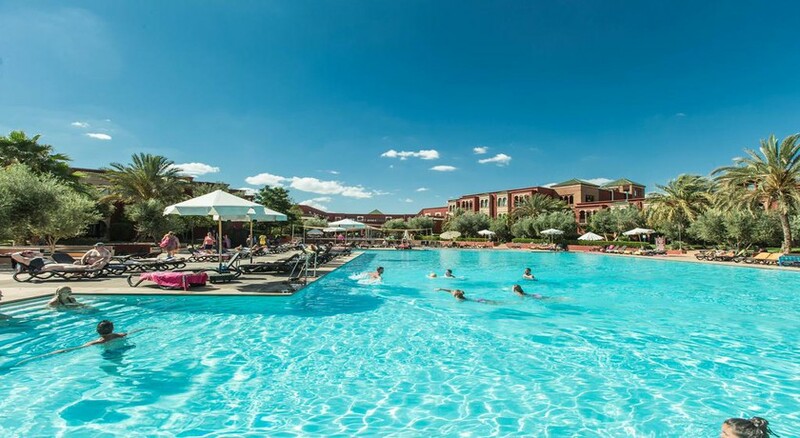 The Eden Andalou Aquapark & Spa is situated in a quiet location in Marrakech enjoying fabulous views of the Atlas mountains. The 5-star hotel is a 10-minute drive from the Medina and the airport of Marrakech, plus it is within easy reach of all local attractions. The hotel provides free transfers to/from Jamaâ El Fna Square too, at just 15 minutes' away it’s a must-see. The Eden Andalou Aquapark & Spa has 253 all-suite guestrooms furnished with a modern décor and Moroccan accents. The hotel invites guests to relax into luxury amidst air-conditioning, TV, telephone, coffee maker and other modern amenities. The guestrooms come in categories like Standard, Pool Side, Privilege, Ambassador and Royal suites. The Eden Andalou Aquapark & Spa has many bars and restaurants to indulge the guests’ palate. The Atlas is a lovely international restaurant, and you have The Fez, a Moroccan restaurant serving delectable local dishes. The Bougainviller is a bar serving all inclusive drinks, or you have the Mimosa pool snack bar ideal for refreshments during the day. In the evening, head to the Jazz Bar which is the perfect for unwinding with a cocktail and listening to music. The hotel is nestled amid a well-maintained garden with a swimming pool and kids’ pool. There is a fitness centre for those who wish to stay active, and a spa with a steam room offering a selection of massages, therapies and beauty services available at additional charge. The hotel has facilities for darts, ping pong, games room onsite and a golf course is 3.5km away. There is lively entertainment during the evenings. 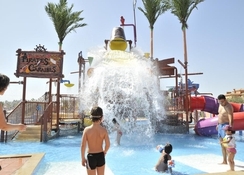 For the tiny tots, there is Kids’ Club and a playground available – and for bigger kids, of course the splash-tastic Aqua Park. Requires: Kattle.coffee.Tea.sugar. And Iron in the room. Lovely hotel and at a good location. Let down and disappointed with the reception staff. Poor communication and poor service. Good quality and clean rooms. Kids thoroughly enjoyed the Aqua park. Always had good fresh food. Always had good fresh food. Rooms were clean and the hotel and staff it self was lovely. Food is really not great. Very boring and bland choices. Hardly any Moroccan food. Spaghetti Bolognese every night. Entertainment was the worst I've seen. This was out 8th stay in Morocco. Entertainment was just some dancing and weird games on stage with guests. You have to pay for the gym which we've never had to do before. While this hotel was nice, I am not sure what warrants the 5* rating. There were no added touches - even water in the room - and the food was adequate. The staff were lovely, but I would hesitate to suggest there is anything special about this hotel. The reviews listed on trip advisors were not as convincing as per hotel standards.I personally don’t rate this hotel 5 stars to me it’s 2 stars.The food was appaulling,The drinks were served in dirty partially washed plastic glasses.The services generally was below par.The rooms were good and clean .Hope this helps.